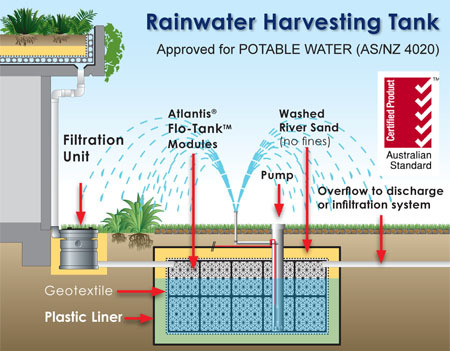 The Atlantis Rainwater Harvesting Re-use System has proven effective in providing a regular clean water supply for domestic and commercial applications. If living in a greener world and understand that recycling such a precious commodity is a greater approach to sustainable living, our Rainwater Harvesting systems are your answer. The system captures water from both landscaped areas through surface infiltration and from roof areas which are filtered through an Atlantis Filtration Unit. Clean water is retained within the storage area away from harmful U.V. light and heat remaining cool underground readily available for reuse. Typical applications include flushing toilets, in washing machines, watering gardens and washing cars.